Innovators Solitaire Valley is one of the residential developments of Innovators Group, located in Allahabad. It offers spacious and skilfully designed 1RK, 2BHK, 3BHK, 3.5BHK, 4BHK and 4.5BHK apartments, penthouses, villas, commercial space and office space. The project is well equipped with all the basic amenities to facilitate the needs of the residents. What is the location of Solitaire Valley?The location of the project is Jhalwa, Allahabad. What is available flat size in Solitaire Valley? Flat sizes in the project range from 380.0 sqft to 1400.0 sqft. What is size of 1 bhk in Solitaire Valley? 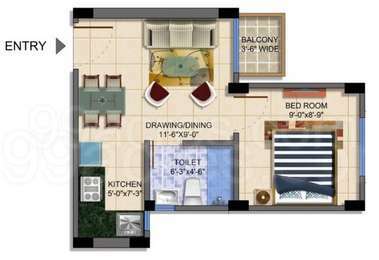 The area of 1 BHK apartments ranges from 380.0 sqft to 431.0 sqft. What is total area of 2 bhk in Solitaire Valley? The area of 2BHK units in the project varies from 762.0 sqft to 888.0 sqft. What is size of 3 bhk in Solitaire Valley? The area of 3 BHK apartments ranges from 1106.0 sqft to 1400.0 sqft. What is total size of Solitaire Valley?The project is built over an area of 200.0 Acres.